KUCHING: The recently debuted ASUS Chromebook Education Series comprises all-new ruggedised classroom-ready laptops with ergonomic design and easy serviceability, with the first-ever ASUS Chrome OS tablet, an 11.6-inch clamshell and convertible, and a 14-inch clamshell. The ASUS Chromebook Education series that provides lightweight, ruggedised Chrome OS computer solutions for educational use, and continues the ASUS commitment to providing an extensive range of innovative products and services for the education sector. The series includes two traditional clamshell laptops – the 11.6-inch ASUS Chromebook C204 and the 14-inch ASUS Chromebook C403 – and the 14-inch ASUS Chromebook Flip C214 convertible. There’s also a brand-new form factor introduced, with the ASUS Chromebook Tablet CT100, a stunning 9.7-inch QXGA wide-angle touch-display tablet. The new series features durability, spill- and tamper-resistant keyboards and all-around rubber bumpers to withstand the rigors that electronics often face in schools. This lineup provides educators and parents with a full-range of lightweight, ruggedised options that can cater to their specific curriculum choices and unleash the creativity and productivity of their students. The new ASUS Chromebook Education series will be available in the coming months with configurations, pricing, and availability to be announced at launch. The ASUS Chromebook C204, ASUS Chromebook Flip C214, ASUS Chromebook C403 and ASUS Chromebook Tablet CT100 boast similar specs and a common design aesthetic, but with a few crucial differences. 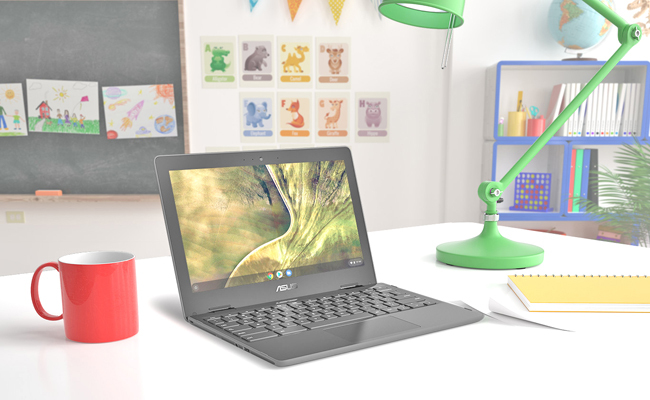 The C204 is the successor to the popular ASUS Chromebook C202, an 11.6-inch laptop made for elementary school students, while the ASUS Chromebook Flip C214 is the follow-up to last year’s two-in-one convertible, the C213. With a touchscreen display, stylus support, and a 360-degree hinge, it bridges the gap between laptop and tablet, and allows for laptop learning as well as more traditional lessons based on pen-based input.